A US officer who commanded a swift boat alongside John Kerry in Vietnam has broken a 35-year silence to condemn the presidential candidate's detractors. William Rood, now a journalist on the Chicago Tribune, said in an article he could not keep silent after seeing TV ads aimed at discrediting Mr Kerry. "It's... harder and harder for those of us who were there to listen to accounts we know to be untrue," he wrote. Mr Rood defended a controversial Kerry tactic of charging ambushers. During a Viet Cong rocket and gun attack in February 1969, Mr Kerry led his boat and two others - including Mr Rood's - at the enemy. A recent book, Unfit for Command, condemns the tactic as "stupidity, not courage" but Mr Rood said it had been praised by their task force commander as a "shining example of completely overwhelming the enemy". The BBC's Dan Griffiths reports from Washington that despite Mr Rood's dramatic testimony, there is no sign of the row going away. On Saturday, Mr Kerry's campaign issued an internet advertisement claiming that the group behind the ads, Swift Boat Veterans for Truth (SBVT), were co-ordinating their work with the Republican Party. 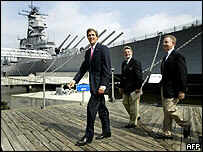 SBVT accuse Mr Kerry of embellishing his war record for electoral gain - a charge denied by the Kerry campaign. 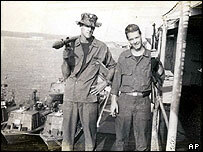 "There were three swift boats on the river that day in Vietnam... three officers and 15 crew members," said Mr Rood. "Only two of those officers remain to talk about what happened... One is John Kerry... who won a Silver Star for what happened... I am the other." The journalist said Mr Kerry, the tactical commander, had asked his fellow officers to join him in charging the enemy in the event of an ambush - a common occurrence at the time. "We agreed that if we were not crippled by the initial volley and had a clear fix on the location of the ambush, we would turn directly into it, focusing the boats' twin .50-calibre machine-guns on the attackers and beaching the boats," he said. "We routed the ambush, killing three of the attackers. The troops, led by an army adviser, jumped off the boats and began a sweep, which killed another half dozen VC, wounded or captured others." Mr Rood quoted his task force commander, Rear Adm Roy Hoffmann, as congratulating the three boats and praising the tactic at the time. However, Mr Hoffmann, now a Kerry critic, said earlier this year that Mr Kerry's action had shown him to be a "loose cannon". "He was aggressive, but vain and prone to impulsive judgement, often with disregard to specific tactical assignments," the retired admiral said in May. "There is anger among Kerry's supporters about the attacks on his war record"